Posted May 22, 2016 by Heather Michet & filed under DIY, Food, Recipes. Chai is a traditional Indian drink that has become a familiar beverage in the U.S. 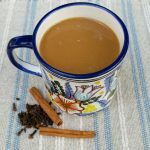 Using several (healing) spices to create the classic cup of chai is not difficult, nor very time consuming, especially when you consider the delightful end result! Making your own allows you to adjust the ingredients to suit your preferred flavors and dietary choices, plus it gives you a hand in your own healing and self-care. Simmer spices in the 2 cups milk over medium low heat for 20 minutes or longer to extract the spice flavors. Add tea to spice & milk mixture, stir and heat together a few minutes. Strain and serve with a hint of vanilla, if desired, and your choice of sweeter. Refrigerate any unused portion – if there’s any left! Chai is great hot or chilled. The goodness comes through no matter what temperature it is enjoyed at. *Assam is typical, but you can choose. If you wish to make it caffeine-free, Rooibos or roasted dandelion make good alternatives.